TOM CRADDOCK has been handed a shock opportunity to impress Paul Cook. The 26-year-old will be at Pompey’s return to pre-season training on Wednesday following an invite by the manager who released him. The striker hasn’t featured for the Blues’ first-team since November 2013 after a career-threatening knee injury and was among nine out-of-contract players let go last month. However, Cook has now asked Craddock back to participate in training as the former Oxford United man seeks to prove his fitness. Craddock, who was signed by Guy Whittingham in the summer of 2013, made his latest return from injury for the reserves against Cambridge United in April. Now he will be striving to show he is over his problems and ready to kick-start his career. Assistant manager Leam Richardson said: ‘Tom is a really good lad and a good pro and asked if he could come back to join in pre-season and get fit. ‘So the manager invited him back in – he is one of those managers who is quite open with things like that. ‘If lads show intent to be a good pro he will help them along the way. ‘And Tom certainly fits that bracket. ‘The initial conversation was about fitness, we will see how it develops. ‘Tom is a good player. He has been around the game for a long time and is spoken about well by other people – that doesn’t happen if you are not a good player. Craddock is the only player released by Pompey this summer who is expected to be at Wednesday’s training return. He made only 11 appearances, with his only goal coming in a 2-1 home defeat to Scunthorpe in November 2013. After fighting back from a serious knee injury, Craddock returned to Pompey’s reserves in January and marked the occasion by scoring in a 3-1 defeat at Fulham. He made four reserve appearances, scoring two goals, before his release. Cook knows what Craddock is capable of after the striker scored four for Oxford against Accrington in a 5-0 hammering in October 2012. That was Cook’s penultimate match as Stanley boss before taking over at Chesterfield. 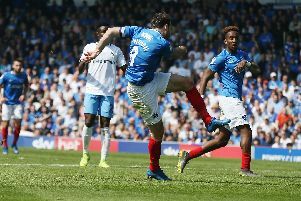 Yet Craddock is not expected to be the only triallist at Pompey on Wednesday as the Blues cast their net and seek to strengthen their playing squad. Richardson added: ‘I think every club looks at the possibility of bringing triallists in. ‘It’s an industry which is unique at the end of every working year in that you get a large percentage of people out of work.